Nordic Bet Poker is a sportsbook licensed by the Lotteries and Gaming Authority of Malta and is one of the leading names online gaming. NordicBet’s poker room, also called NordicBet, is a poker room that is part of the enormous and continually growing Microgaming Network (formerly known as the Prima Poker Network). This means players will be able to find lots of action! NordicBet’s Sit and Gos receive a good amount of traffic, especially in the micro stakes (€0.05+€0.01 to €0.50+€0.10), small stakes (€1+€0.20 to €5+€0.50) and medium stakes games (€5+0.50 to €20+2). High stakes (€20 and up) are not as popular, but still have quite a few games running around the clock. The No Limit Hold’em SNGs are by far the most popular, but occasionally a few Omaha and Omaha H/L SNGs run for players that enjoy those poker variations. In addition, NordicBet offers 5 Card Draw SNGs. Players that are into cash games will be happy to find that NordicBet provides tables from €0.01/€0.02 all the way up to €50/€100! The scheduled tournaments are also plentiful with lots of guaranteed tournaments. On Sunday, NordicBet offers one of their largest tournaments, a €55+5 rebuy tournament with €100,000 guaranteed. NordicBet even offers satellites to the Aussie Millions live tournament, including freerolls into the satellites. They also offer a wide variety of games, including Hold’em, Omaha, Omaha H/L, Razz, 5 Card Draw and 5 and 7 Card Stud. These tournaments usually draw a few hundred competitors, meaning there are less players to beat to win and a bigger chance at an overlay. Nordic Bet Poker is a skin of the Microgaming network. Downloading the poker client takes less than a minute with a DSL or cable connection. For those who do not like downloading software, though, NordicBet also offers players the ability to play right from their browser. Players that would like to play from their browser just have to install a browser add-on developed by Microgaming Software Systems Limited. VeriSign Inc., a company that provides a variety of security services, has also signed the control which confirms Microgaming as a legitimate commercial software publisher. This ensures the add-on is completely safe to install. In the browser version, players are asked to log on and select a game preference using buttons located at the top of the table. 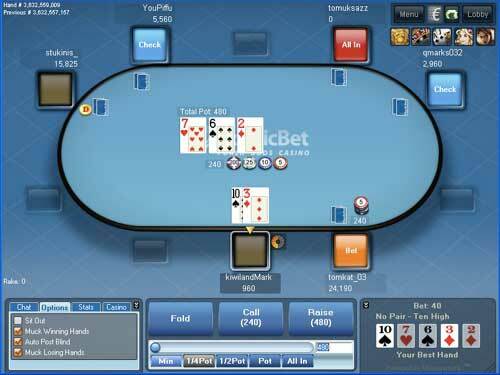 Once preferences have been selected, players are asked to click “Join Table”, which will automatically sit them at a No Limit Texas Hold’em table. While very limited in options, this browser version does give players, who are not able to download software onto their computer or device, a chance to play No Limit Hold’em. As for the actual poker client, NordicBet has produced a simple, easy to use program. Although the default lobby is somewhat clunky it still provides players easy access to all the games. Cash game, SNGs and Schedule Tournament tabs are located at the top, with filters for game variation, buy in range and other options located below. Players who aren’t a fan of the default lobby can actually change to another style by clicking the Change Lobby button, located along the bottom of the client. There is even a very simplistic lobby called “1-Click” which will put you in a cash game, SNG or scheduled tournament with just one click of the mouse. Being a skin of the MicroGaming/Prima network, NordicBet’s tables look similar to the rest of those on the network. Tables are very simplistic and clean. Small squares display avatars and the action players have taken, such as bet, raise or fold. The cards are easy to read, making multi-tabling much easier. The betting options also have a simple design and players are given the option of typing in their bet, using a slider or using the preset amounts of 1/4th pot, 1/2 pot, pot and all in. Ever want to play poker with just your friends, but can’t get everyone together? Well NordicBet can help. They give an option to create your own password-protected tables. Players can select the game type and the buy-in for these private tables. A feature that NordicBet’s client provides is access to their casino games. Players who are in the mood to try out some table games, or any other casino games, can click the “Casino” button located at the bottom. Because of the size of the Microgaming network, action at Nordic Bet Poker during peak hours is good, especially in low to mid stakes SNGs. During off hours, cash game traffic can be a bit scarce at all but the lowest No Limit Hold’em limits. Regardless, the action is still enough for players to play at the stakes and games they like at nearly any hour of the day. Nowadays, players everywhere are getting better at poker. The games at Nordic Bet Poker have decent multitabling regs and the higher stakes games are usually regs looking for fish. Despite this, NordicPoker still has more than its fair share of fish, especially at 100NL and below. You will find a wide array of them at Nordic, including passive calling stations and bluffing maniacs. Each bonus expires after 60 days and requires five times the bonus amount to be raked. Each bonus pays out in a different number of installments; check the Nordic Bet website for full details. Nordic Bet’s “Poker Rewards” is available to all players who gather 1 Poker Point or more during one month. In this VIP Club, players have exclusive access to private tournaments, satellites to live events, and cashback every month. The benefits increase as you level up from Bronze, through Silver, on to Gold, and finally Elite. At the Elite level, players will receive 30% cashback, a monthly reload bonus, free sports bets and free casino spins. It’s possible to achieve a valueback rate of 56% by reaching the top tier of the Poker Rewards program. Note that you can reach this exalted rank simply by generating $300 of rake in a single month! Click here to join Nordic Bet Poker! Nordic Bet Poker offers many different ways to get in touch with their support staff. Their live chat and email representatives are available 24 hours a day. NordicBet also claims to attempt to answer all emails within 15 minutes with their English and Scandinavian speaking staff. Additionally, NordicBet provides a phone number to reach customer support. Phone representatives are available Monday-Friday 08:00-20:00 CET.